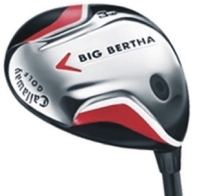 Big Bertha Fairway Woods boast larger head volumes (202 cc in the 3-wood) and shallower face designs for increased forgiveness and confidence at address. Increases the moment of inertia (MOI) by reducing twisting on off-center hits, resulting in straighter shots. The larger effective hitting area makes it easy to get the ball airborne for optimum trajectory. The longer face (from heel to toe) increases MOI while the lower leading edge is designed to increase confidence at address. The clubhead rests on two distinct areas of the sole, eliminating the tendency of the head to rock back and forth, helping ensure that shots start on-line. The sole also provides improved turf interaction from a variety of lies. The Correct Alignment Stripe works in conjunction with the Chevron logo, allowing golfers to consistently square the club face at address to ensure correct alignment.